In the end, Democrats, the Left, and other progressive sects have learned a lesson, even if they don’t realize it, you don’t mess with Cocaine Mitch. It was a brutal fight. Judge Brett Kavanaugh, who President Trump had nominated to fill the vacancy left by Anthony Kennedy, was being eaten alive by the left-wing smear machine. He was facing three allegations of sexual misconduct that lacked in evidence or corroborating witnesses. It looked as if this fight was going to be a smooth win, but these allegations, dropped at the last minute, dragged us into the gutter. Senate Majority Leader Mitch McConnell said he never considered urging the White House to withdraw Brett M. Kavanaugh’s nomination to the Supreme Court and called opposition to the judge a “great political gift” for Republicans ahead of next month’s midterm elections. In an interview with The Washington Post hours before Kavanaugh’s near-certain confirmation on Saturday afternoon, the Kentucky Republican again underscored his confidence in Kavanaugh’s denials of allegations of sexual misconduct decades ago while decrying the protesters who have challenged senators for days. 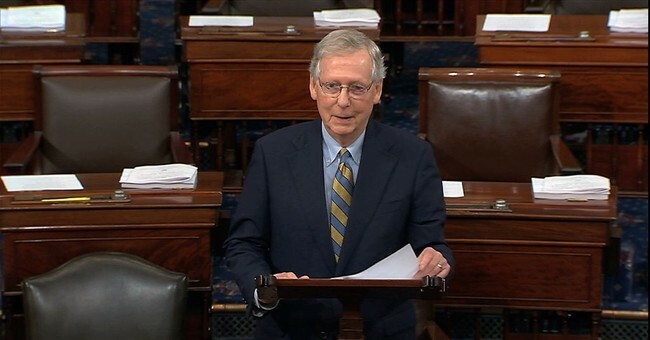 McConnell, overseeing a razor-thin 51-49 GOP majority, said the GOP is already seeing a boost in polling in Senate races because of the Democratic opposition to Kavanaugh combined with the protests. Republicans are on offense in the fight for control of the Senate, with 10 Democrats seeking reelection in states President Trump won in 2016. An NPR/PBS NewsHour/Marist poll released Wednesday indicated that the battle over Kavanaugh's nomination had helped close the enthusiasm gap. Polling showed that Joe Manchin’s re-election would be all but assured if he voted for Kavanaugh. Overall, Red State Democrats were put in a terrible political positionin this nomination fight. They could vote for Kavanaugh, but risk the wrath of the progressive grassroots and loss of access to key Democratic campaign financing. And they could vote against him, but be forced to update their resumes because they would be out of a job come January. Claire McCaskill knows this all too well. On the Right’s flank, Arizona and Tennessee could be Democratic pick-ups, though I doubt how a rural, GOP state like Tennessee flips, but we’ll see. Missouri and Florida look like likely pick-ups for the GOP. If we hold the line in Tennessee, lose Arizona, and win in Missouri and Florida, we’re left with how the upper chamber started at the last Congress, 51-49. Still, a lot can change. The polling post-Kavanaugh has yet to be released. And in Arizona, Democrat Kyrsten Sinema has been caught telling some tall tales about her upbringing. Stay tuned, but the fact remains that the GOP position is much better than in the House—though with the base energized, perhaps we could hold the line there. It would be a slim majority, but still a win—and one that would trigger another liberal meltdown. “Joe Manchin’s still a Democrat, and we’re trying to hold the majority,” the Kentucky Republican said on CBS’ “Face the Nation” when asked if he would tell President Donald Trump not to campaign against the red-state Democrat. Maybe Manchin should re-register as a Republican if he wins re-election, which he very well could, despite West Virginia being a deep-red state.